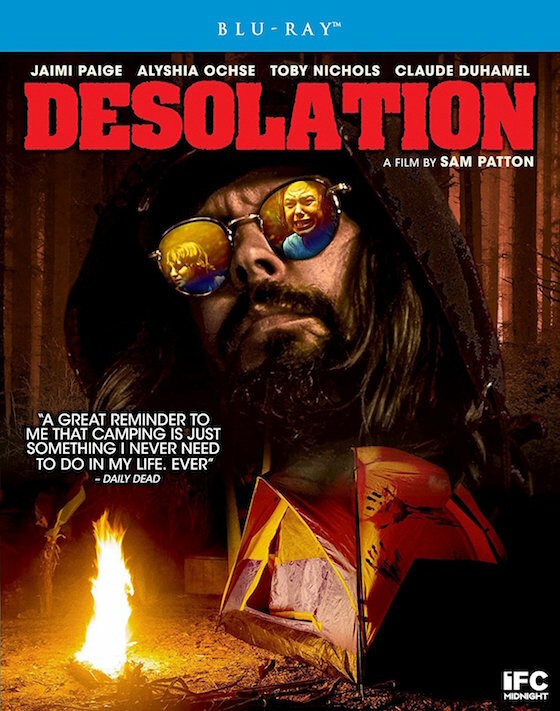 Having toiled for years in the Blumhouse movie factory as both intern and paid hand, it is readily evident that many good things rubbed off on Desolation director Sam Patton, as his first feature film is a certified gem in the world of indie horror. Blumhouse got its start producing low-budget films – mostly horror, and went on to experience its first legitimate breakout hit with 2010’s Insidious which has made millions at the box office and spawned an entire Insidious Cinematic Universe of sequels, prequels, and loosely-related crossovers. The Blumhouse formula to success is simple: produce low-budget horror films, set in contained environments, with small casts. But what isn’t so simple is finding the perfect script and a director with the skills to carry the vision to the masses. That’s where Patton comes in. If there’s one thing he learned that really shows in Desolation, it is that he works with what he has by keeping the story short and simple. He gives us interesting and relatable characters that we actually care about. And it’s a good thing that we care for them because there’s a very bad man in the story who certainly doesn’t. But more on that later. First, our protagonists are Abby (Jaime Page) and Jen (Alyshia Ochse) who, along with Abby’s son Sam (Toby Nichols) and whatever they can strap to their backs, venture out into the woods on a camping trip that will last for several days. But this isn't a pleasure trip, as we learn that they are hiking out to Abby’s husband’s favorite spot – an overlook, where they will scatter his ashes. Seems he died at a young age and has left a heartbroken wife and pre-teen son to figure out how they will get by without him. Desolation’s next biggest success is how effectively Patton and screenwriters Matt Anderson and Michael Larson-Kangas utilize the environment to drive their story’s tension and to create a sinister mood that preys upon our fears of being alone. In the film’s opening scene, we’re immediately plopped down deep in the middle of a forest, and we never see anything but forest. No establishing drone shot looking down on the family’s car as it drives, and no scenes of a happy family packing for their journey. Just, boom! Trees, bushes, limbs and dimly lit shadows everywhere. Every scene looks exactly like the one before it, making the fact that a stranger (Claude Duhamel) is lurking in the shadows feel that much more inescapable. The “hiker” is first spotted in the distance by Sam; a dark, bedraggled figure on the other side of the lake. As the camera pans away from Sam’s curious face back to where the man is standing… he has vanished. The mysterious figure continues to reappear throughout their trek, shadowing their movements but never engaging… until one night when his backpack is spotted in the middle of their camp and Jen’s tent is ripped wide open. Things just got real. But there’s a huge problem with this mysterious lurker. One that hobbles the film quite significantly. First, the filmmakers seriously missed with his look and feel. The villain wears round, mirrored sunglasses with a newish hoodie pulled up over his head, and carries a long, wooden staff. He looks more like a Led Zeppelin album cover or an Emo rap artist about to drop his next CD than he does a menacing villain looking to bring down the hatchet on our innocent protagonists. And sorely missing is a motive for all the bad things the stranger represents. We know from the poster (which is a quite beautiful piece of art in itself), trailer, and synopsis that he means serious harm. But even when he flips his switch, we don’t know why, nor do we really learn what he is capable of. Because of the poorly-drawn villain, the film’s fear and menace simply isn’t as powerful as it should be. A horror film with a bad villain typically spells doom, but there are so many other good things going on with Desolation that it remains a strong recommend and a worthy platform from which to watch Patton’s career take off, which will certainly happen. Take a hike into Desolation. Just be sure to bring somebody with you. Oh, and never go off trail. You can watch Desolation now on Amazon streaming, Vudu, or itunes. Memorable Movie Quote: "He looks like a wizard." Synopsis: Following her husband’s death, grieving widow Abby (Jaimi Paige), along with her son (Toby Nichols) and best friend Jen (Alyshia Ochse), journeys into the forest he loved to scatter his ashes. As the friends wander the wilderness and reminisce, they’re struck by a rising feeling of dread: They are not alone. But who is the mysterious, silent stranger in sunglasses stalking their every move? Meet The Hiker (Claude Duhamel), every camper’s worst nightmare. Suddenly, the trio find themselves the hunted prey in a deranged killer’s terrifying game. The nerve-shredding feature debut from Sam Patton will make you think twice before venturing into the woods. Shout Factory’s handling of Desolation is a knockout on HD. 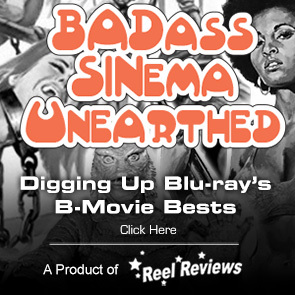 The AVC encoded 1080p transfer is presented here with an aspect ratio of 1.78:1. The film is expertly shot and the color saturation provides minute detail puncturing, replicated here in great moments of detail, textures in the woods, and atmospheric environmentals beneath the surface. The mood is sharpened throughout the feature by the costumes. Fortunately, even threads are visible in this fine presentation. The transfer handles all the happenings expertly. Blacks are deep and colors, as mentioned early, are varied and supple. The lossless DTS-HD Master Audio 5.1 track that accompanies the picture is just as strong, rattling window frames and walls with its immersive field of sound.